For a Limited time, you can get a FREE Kill-A-Watt Electric Monitor with purchase of either a VM150 (wall mount) or VM170EZ (easy machine mount) Vending Miser unit. No complex data logger or computer connection is required. This is the same unit used by Boeing Engineer, Greg Brokaw, to determine the savings before purchasing enough units to equip multiple campuses. 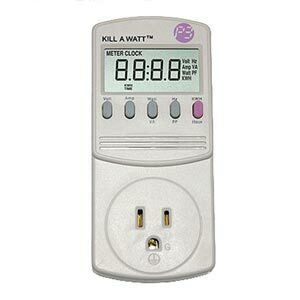 In the past, we have recommended data loggers that can cost hundreds of dollars. Now we’re simply giving away this little unit with a single VM purchase so you can prove to yourself the savings are real. Hook up the Kill-A-Watt without the VendingMiser installed and allow the machine to run for a few days. Install the VendingMiser intelligent vending machine control module and allow the machine to run for equal time. It’s that simple – and it’s Free.